Donald Trump’s recent retweets of inflammatory anti-Muslim videos posted by the far right group ‘Britain First’ sparked outrage last week, a row which intensified when Theresa May said it was wrong for him to do so, which in turn prompted a twitter rebuke from Donald Trump in which he said suggested she should be focusing on the destructive Radical Islam in the UK rather than criticizing him. The videos purported to show Muslims pushing a boy off a roof, destroying a statue of the Virgin Mary, and beating a boy on crutches. However, the Daily Mail points out that state visits have been extended to all sorts of immoral characters in the past – such as Nicolae Ceausescu of Romania and Robert Mugabe of Zimbabwe. NB IMO the above statement from the Daily Mail is a great example of something which isn’t (technically) an argument) – that we shouldn’t cancel a proposed state visit because we have a tradition of setting a low-ethical bar for people invited to past state visits isn’t a rational reason for not changing current policy – it’s an irrational appeal to tradition/ emotion, thus not logical, thus not an argument. According to Max Hastings in the Daily Mail, Trump’s tweets also reveal something about the ‘special relationship’ between Britain and the USA – namely that the UK likes to flatter itself that there is one, but the reality is that this special relationship never actually amounts to much in terms of the USA doing anything for the UK… This might be a warning about not relying on the USA as one of our post-Brexit saviors. As to why Trump posted those tweets, besides being an impetuous Racist, there may have been a self-interested political motive – these tweets may have been aimed at his own far-right American audience…. and he needs their support for his ‘Mexican Wall’ project. Noam Chomsky – The Decline of the U.S Superpower? In this talk Noam Chomsky emphasises that Trump’s election and his climate change denial threaten the very existence of the planet and the human species; and he also reminds us that despite America’s increasing political isolationism, U.S. Corporations still reign supreme. Chomsky starts by saying that he was in Spain when he heard the results of the U.S. election, and the various commotion and commentary which surrounded it, but in fact the first very real negative consequence of Trump’s victory happened on the very same day and yet went largely unnoticed by the world’s media. At the very same time as the U.S. presidential election results were being announced and analysed, COP 22 was taking place in Morocco, which was the first meeting of the signatories to the Paris Climate Change agreement (COP21) at which most countries agreed in principle to take concrete action to reduce dependence on fossil fuels and try to slow down global warming. The Paris Climate Change Agreement – Ruined by the Election of Donald Trump? Because the specifics of the actions to be taken had been left vague after the Paris meeting, the point of COP 22 in Morocco was to start to add in the specific details of the agreement, however, following Trump’s election, and his commitment to scrapping current environmental regulation and monitoring in the U.S., COP 22 ended with no further progress having been made. In fact, the agenda of the global climate change framework has now changed to one of ‘how can we combat global warming without the U.S. on board’, and nations have now started to look to authoritarian, anti-democratic China for leadership if any progress is to be made in this area. Chomsky is very clear that environmental catastrophe is now one of the biggest threats facing the survival of the species (the other is nuclear war), and he focuses on Asia to highlight the coming global problems. In the next few years, 10s of millions of people will be fleeing from Bangladesh because of the severe level of global warming resulting in sea levels rising, which would be a real refugee crisis, unlike the present one which he casts as a ‘moral crisis’ of the European Union. Again in Asia, a second environmental crisis looms in India and Pakistan, in the form of potential conflict over scarce water resources – two states with nuclear weapons, which potentially trigger a survival crisis for the human species. Chomsky’s next point is that U.S. isolation in the world is increasing in remarkable ways: the U.S. had been heavily involved in South and Latin America in the decades following World War Two, but the IMF has been completely kicked out of some countries in this region and has no military basis in the region at all; elsewhere in the world the TTIP has all but collapsed and other trading blocks are growing in scope, mainly centring around China, which are drawing in some of America’s historical allies such as Peru and New Zealand; finally with Brexit America has lost it’s main ally in Europe, the U.K., which could reduce its influence in Nato. However, these measurements fail to take into account the crucial factor of the ownership of the world economy – which is virtually never discussed – CORPORATE ownership of wealth. If we look at Corporate wealth, U.S. Companies are well in the lead in terms of ownership of the the global economy, and they are own over 50% of the world’s wealth in nearly every sector of the global economy – manufacturing, finance, services etc… of course although this wealth is held in the U.S. and supported by public money, it is not shared by all the citizens of the U.S. If you look at the military dimension, the U.S. is of course still supreme. Chomsky finishes by reminding us that the threats we now face are matters of human survival and they cannot be ignored, they need to be faced directly and soon if the human experiment is not to be a disastrous failure! How to use this in the Global Development Module? Basically it fits into the ‘how important are nation states’ aspect of the course. Firstly, Chomsky seems to be suggesting that the United States still has enormous influence in the world – in that its lack of action on climate change means that it is able to disrupt the ability of other nation states to take coordinated action on climate change (whether this actually happens remains to be seen). Secondly, it seems that other countries are becoming more powerful than the United States, and the U.S. is losing its political influence in certain ways. However, if we look at the real ‘power indicators’ – wealth and military expenditure – the U.S. is still by far the dominant superpower. Donald Trump’s Political Appointments – TNCs to shape U.S. Social Policy? Trump’s political appointments seem to illustrate an extreme neoliberal approach to politics – those who are successful at business are being placed into senior positions in the U.S. political system which will allow them more power to shape domestic and foreign policy. 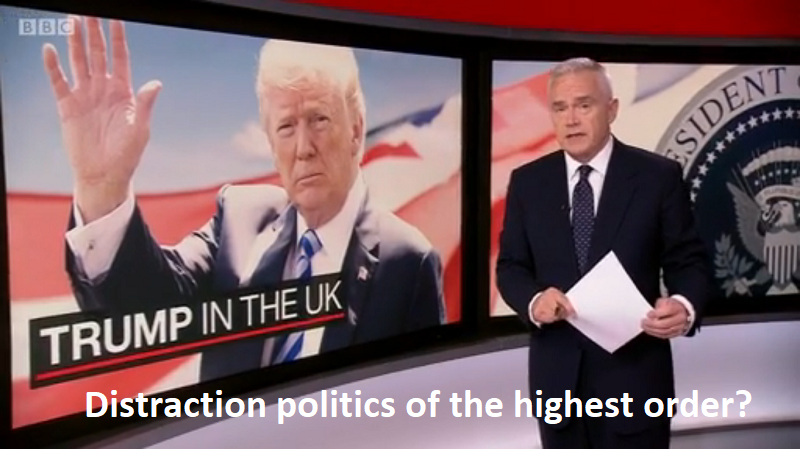 According to a recent Guardian article on Donald Trump’s political appointments he ‘has so far nominated a number of billionaires, three Goldman Sachs bankers and the chief executive of the world’s largest oil firm to senior positions…. His team [has been] dubbed the “team of billionaires”. Trump’s (neoliberal) argument for these appointments is that the accumulation of wealth is a sign of success and that having internationally successful business people in positions of power to negotiate (or renegotiate) trade-deals will benefit the U.S. economy and the the American people. It is the selection of Exxon’s chief executive, Rex Tillerson which has caused the most controversy. Tillerson has a close relationship with Vladimir Putin and some years ago agreed a joint venture with Russia to drill for oil in Siberia and the North Sea, however this venture was shelved following sanctions against Russia when it annexed Crimea. As secretary of state, Tillerson (who has $250 million of Exxon stock) will be leading discussions on whether the US should maintain sanctions against Russia. Trump’s pick for treasury secretary, Steven Mnuchin, is also a multimillionaire former Goldman Sachs banker who went on to be dubbed a “foreclosure king” for buying up distressed mortgages and evicting thousands of homeowners during the financial crisis. Elizabeth Warren, the Massachusetts Democratic senator, called Mnuchin “the Forrest Gump of the financial crisis” because he “managed to participate in all the worst practices on Wall Street” during his lengthy career, suggesting that he was one of the main instigator’s of the 2008 financial crisis. Increasing wealth and income inequality in the U.S. – With the transnational capitalist class now in direct control of U.S. domestic and foreign policy, there is every likelihood that the super rich will get richer while the income and wealth of the majority of U.S. citizens will stagnate or even go into reverse. Critics such as Warren (above) argue that Donald Trump has every intention of running Washington to benefit himself and his rich buddies”. Less respect for human rights globally. The appointment of Tillerson as Secretary of State and his close relations with the human-rights abuser Vladimir Putin suggests that the financial interests of the super-rich will trump (excuse the pun) issues such as respect for universal human rights – it’s more likely that the U.S. will turn a blind eye to dictators who trample on human rights, so long as there’s a profit to made for U.S. companies. More economic instability – The fact that Goldman Sachs executives now have greater say in shaping U.S. economic policy could mean more deregulation of financial markets and more instability in the global economy in the long run. Environmental decline – this is possibly the beginning of the end of life on planet earth as oil companies will almost certainly be given the green light to dig up the arctic. Where can you use this in the A Level Sociology Course? It demonstrates the increasing power of TNCs – yet how they need control over nation states to empower themselves. It’s a great example of how the global super-class work – at a level above that of the nation state.